1 What is a Gun Safe? 2 Why is Gun Safe Humidity Important? 3 What Level Should Gun Safe Humidity Be? 4 How do the Best Gun Safe Dehumidifiers Work? For many people that have invested in guns, ammo or other priceless valuables, having a safe is essential to safeguarding your possessions. Gun safes provide a secure location to keep your items while they are not in use. Some people find it helpful to own one of the best gun safe dehumidifiers in an effort to keep the humidity and smell down inside. Here’s a complete guide to the best gun safe dehumidifiers, why you need one and how to pick the variety that is right for you. A gun safe provides a protective, secure storage location for your firearms and ammunition. They are used to stop unlawful access by unqualified people and protect your possessions in the event of a burglary. Depending on the safe, you may also have protection from floods or fires. In many places, the law requires gun owners to prevent access to their guns with the use of a lock, cabinet or gun safe. While gun cabinets used to be a popular option, more people are turning to the help of a gun safe. Why is Gun Safe Humidity Important? Your safe is sealed, so you automatically assume that humidity isn’t an issue, but that’s not true. Depending on where the gun safe is stored, it could be experiencing a moisture build-up. This is relative to temperature changes plus other external forces that you may not be able to control. One day, you might go to your gun safe and find mildew on your shelves plus condensation resting on your precious firearms. For the cost of a dehumidifier, it makes sense to have one in your gun safe at all times. This isn’t an investment to take lightly as you want one of the best gun safe dehumidifiers you can find. This will protect your guns from rusting as well as protect the safe from mildew and other harmful elements. Considering you probably store thousands of dollars’ worth of prised possessions in your safe, it makes sense to spend a few bucks to protect them. Not only that, but you can find gun safe dehumidifiers in a variety of sizes, so it is easy to get the ideal one for your large or small safe. What Level Should Gun Safe Humidity Be? Most people assume that there is no need for any humidity inside of a gun safe. The reality is that your ideal humidity level inside the safe should be at about 50%. Anything less than 50% and you risk damaging your wood stocks because they dry out. With humidity levels reaching higher than 50% inside the safe, moisture levels will rise. This causes condensation to lie on the firearms which eventually leads to rusting as time goes on. Many people use their gun safes for more than just guns. In fact, if you store photographs, cash or jewelry in your safe, it is also affected by moisture. You risk those possessions becoming mouldy, musty and full of mildew. To check the humidity levels inside your gun safe, purchase a humidity monitor. Place it in the safe and then check the levels after about 12 hours. You will soon see if you are in need of one of the best safe dehumidifiers for your setup. How do the Best Gun Safe Dehumidifiers Work? When you are in the market for a gun safe dehumidifier, you’ll quickly notice that there are two major types available. Here’s what you need to know about the varying choices. Desiccant dehumidifiers absorb moisture just like a sponge. These are often rechargeable or disposable depending on the style you purchase. They don’t require the use of electricity so you can place them directly inside the safe. You’ll need to be sure that you monitor the moisture capacity closely over time. This is your best option for a smaller gun safe because they aren’t capable of extracting large amounts of moisture. If you need this option for a larger safe, you’ll want to purchase more than one. An electrical dehumidifier uses heat to lower the humidity levels. By creating a consistent temperature within the safe, you suffer from less condensation. If you decide to purchase an electrical dehumidifier, keep in mind that you will need access to a power source. This option only works if you have an electrical outlet inside the safe or your run wires through a hole in the gun safe. Inspect the gun safe to see if there is a hole already supplied for this purpose. If the hole is located at the bottom of the safe, the chances are that’s for bolting it down to the ground and not to be used for wires. Here’s a list of the five best gun safe dehumidifiers that are currently on the market. Heated rods are one of the best ways to prevent corrosion on your stored items. That’s why we love the GoldenRod Dehumidifier as the top option for best gun safe dehumidifiers. This company is located in California and has become a popular brand among gun owners. It is also one of the few dehumidifiers with a lifetime guarantee. While most dehumidifiers lower the relative humidity by removing water from surrounding air, the GoldenRod lowers the humidity by heating the air. This isn’t just helpful from the humidity but also to increase the difference occurring between ambient temperatures and dew point. Inside the glass tubing of the rod, you’ll find an electric element that heats the air. It is then insulated in a naturally occurring mineral known as Vermiculite. This construction means the rod is virtually indestructible when used properly. It also distributes heat evenly. The maximum temperature of the rod is 150 degrees Fahrenheit so you don’t want to hold it in your hands, but it is also low enough that a fire couldn’t start, even with a piece of paper. Mounting the unit on the floor of your gun safe is the ideal application. This way, the warm air rises while cooler air circulates which prevents condensation. The unit comes with a bracket to fasten on the floor of your safe and then the rod easily snaps into those supports. Once installed, you simply pass the power cord through to an electric outlet. If you don’t have a pre-drilled hole for this, you’ll have to drill one in the cabinet. The GoldenRod Original Dehumidifier is also available in multiple sizes ranging from 12 to 36-inches long. This allows you to customise the rod to the space of your gun safe. The next rod to top our list of the best gun safe dehumidifiers is from Lockdown. It’s very similar in style and operation to the GoldenRod, but the price is slightly lower. Again, you’ll want to place this on the bottom of your gun safe while it alters the temperature to reduce condensation. Unlike the GoldenRod, it only features a one year warranty and reaches 120 degrees Fahrenheit. In addition to that, there are only two sizes available; 12 or 18-inches. The Lockdown does come in 110 or 220-volt models which is a nice option for some. With this unit, you can expect temperatures inside your gun safe to rise up to five degrees. This is just enough to keep the relative humidity down while adequately protecting your firearms from rust and corrosion. It is also the ideal size for collections of 18 to 36 guns. If your safe is larger than that, it would be wise to consider upgrading to the GoldenRod instead since there are more size options available. There are two brackets to mount the rod on so installation is a breeze. You will need a pre-drilled hole in the bottom of your safe for this unit as well. Keep in mind that the cord on this unit is six feet long. Make sure that you have the gun safe near an outlet or supply an extension cord to make installation easier. 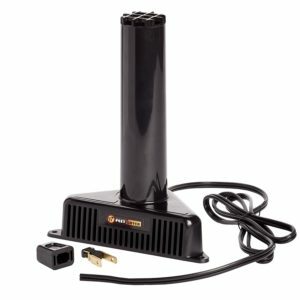 The Lockdown Dehumidifier Rod is the best choice for someone that wants a high-quality rod design without the larger expense of the GoldenRod. Sure, you are missing out on a few of the size options and the higher temperature, but it is sure to get the job done for most people. The PEET Dryer is another popular dehumidifier that utilises technology to dry out the safe. They might be better known for some of their dryers used on gloves and boots, but they are a reputable brand loved by their loyal customers. You’ll first take notice that the dehumidifier design is slightly different than other models of electronic rods. The biggest difference is that instead of lying horizontally on the bottom of your safe, this rod sits vertically. It is best placed in the corner of your gun safe. What some users don’t like about this design is that it takes space away from where you would store some of your larger guns. If you find that your safe is already slightly cramped, you may not want to opt for this design. Like the other rods, the PEET Dryer is one of the best gun safe dehumidifiers because of the way it is used. The rod creates heat which lowers the moisture level and protects your valuables. Once you’ve plugged it in, the heat rises out of the top of the rod. With no fan, you won’t have noise or noticeable airflow; just the heat needed to lower humidity levels. It does feature an easy installation as the others have. Also, the price is lower than your GoldenRod model, but it only comes in one size option. This might not be enough for larger gun collections. One other perk to the PEET Dryer in comparison to the Lockdown is that this unit comes with a 5-year warranty which is pretty generous. For the price and the guarantee, it is a great option for anyone that has the room for a stand-up unit. This GERO model might not be an obvious choice as one of the best gun safe dehumidifiers, but it is worth a look. The silica gel technology is effective at eliminating odours and excess moisture in small spaces. 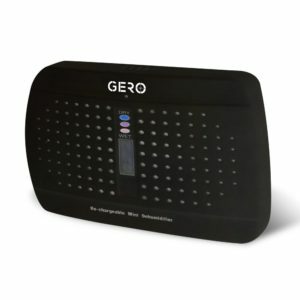 The GERO Moisture Eliminator is quickly rechargeable in about ten to fifteen hours simply by plugging it into power through the UL cable that comes with the unit. This makes it an ideal choice for more than just the gun safe. Consider using it on a boat or travel trailer as well. With this dehumidifier, your gun safe remains at a humidity level of less than 40% when used properly. This prevents rust and corrosion which saves you a lot of money. The GERO Moisture Eliminator isn’t a heated rod design, so you won’t feel any heat coming from the product. Instead, it absorbs moisture through the silica gel inside the unit. This makes it a renewable and eco-friendly option. In addition, it is pet and child safe. Aside from that, customers find that the unit lasts up to ten years depending on how it is used and the price is quite reasonable. The contents are also spill-proof so you won’t have to worry about any mess. The downside to this design is that it has to be recharged. Unlike the rod versions, this is going to require some attention and maintenance on your part but is ideal if you don’t have a power outlet in or near your gun safe. If you decide later down the road to upgrade to the rod design, you can move the GERO Moisture Eliminator to other areas of the home like your bathroom or closet. If you want to find one of the best gun safe dehumidifiers in a silica gel format and you are a fan of the Lockdown brand, then you are going to get excited about this! This dehumidifier features the silica gel beads ideal for smaller sized safes plus they are rechargeable in your oven at 325 degrees Fahrenheit. When it is time to recharge them, the beads simply change colour to alert you. Some users have found that the best way to use this is to set up two units in the safe. Simply place one at the bottom and another at the top to ensure the humidity is absorbed properly. Other users find that it makes a great addition to use in conjunction with an electric rod design as a backup precaution. Before placing it in the safe, you’ll want to charge it. Your beads are deep blue when it is absorbing water. If they are purple, it isn’t ready. Once they’ve absorbed all the humidity they handle, the beads will change to orange to alert you. It’s a fairly simple design. Just like the GERO Moisture Eliminator, you need to pay attention to the unit on a regular basis. Most people found that charging every few weeks was sufficient, but that is a downfall to some users that don’t want to take the time to observe a dehumidifier. Obviously, recharging times are going to depend on how humid your safe is. Some people will recharge more often than others based on the area they live in and the gun safe design. 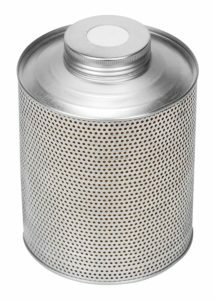 This vented can provides protection up to 57 cubic feet, so you’ll want to keep that in mind when you decide how many to purchase. With all the options available to you, it is easy to determine what the best gun safe dehumidifiers are for your particular needs. Whichever design or style you choose, remember that it is going to be the key to protecting your ammo, guns and any other valuables you store inside. Save yourself from the cost of having rusted and corroded guns by investing in the best guns safe dehumidifier that you can. You’ll be thankful you did.